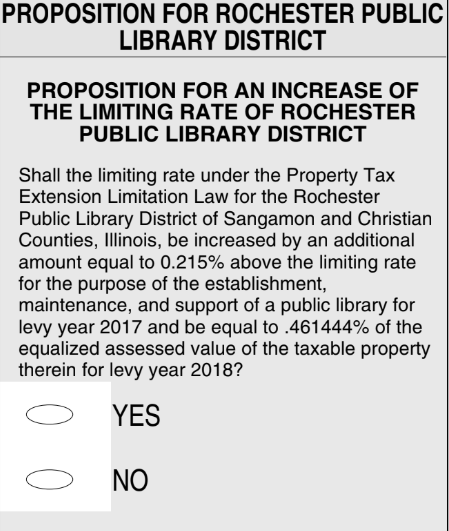 On November 6, 2018, the Rochester Public Library District is asking residents within the Sangamon and Christian County library district to vote on a tax rate increase for an approximately $3.2 million dollar bond which will expand and renovate the library to address increased use of the library and cover operational costs. VIEW BALLOT QUESTION FOR NOVEMBER 6TH ELECTION. Our population has grown by 36% since 1990. Our circulation has increased by 41%. The number of library card holders has increased by 51%. The number of programs offered has increased by 367%. Program attendance has increased by 207%. Library visits (door counter) have increased by 222% in the last 5 years. How were the plans developed? The library prepared a strategic plan in 2016 that identified the need for more space in the library. The development of the plan included input from members of the community. In early 2017, the Library enlisted Fred Schlipf, U of I professor, author, and nationally known expert on library form and function, to create a “Building Program” for the Library, at no cost. The Building Program identifies the space needs for the Rochester Public Library based on the characteristics of the community it serves. In early 2018, the Library’s archictect, apaceDesign, created schematic drawings and preliminary cost estimates that satisfy the space needs identified in the Building Program. In March 2018, trustees and staff began having dozens of one-on-one conversations with community educators, leaders, and neighbors, to seek feedback on the proposed plans for the library. The library board has not increased the library budget since 2004. State aid to libraries has gone down every year since 2010. Springfield’s recent annexation of properties around Lake Springfield have removed several dozen taxable properties from the library taxing district. Due to the combination of TIF hold backs, the decrease in state aid, and the increase in costs of running the library day to day, we have run out of options. In 2017 the library enlisted the help of Fred Schlipt, U of I professor and author to create our Building Plan. The board hired an architect (apaceDesign) to create schematic drawings and preliminary cost estimates that will meet the needs of the community.